Deontay Wilder is 8/13 to beat challenger Tyson Fury when he lays his WBC heavyweight championship of the world on the line at the Staples Center in Los Angeles, but the Bronze Bomber will enter the ring already well behind on the scorecards for verbal violence. 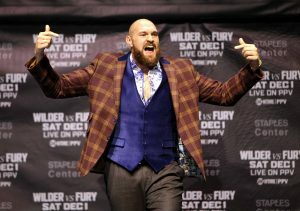 Wilder has been keen to remind us that he’s “the baddest man on the planet” over the past couple of months, but, against an orator of the Gypsy King’s indefatigable loquacity, such a bog-standard barb can only be equivalent to the wild power shots Fury expects his rival to resort to in the ring. The Manchester-born member of the travelling community may be the 11/8 bout betting underdog, but, if press-conference pugilism is any steer on the action that awaits, he’ll be having his day in LA. Fury proving his prodigious reach applies to pre-fight trash too, with this observation from a presser in the build-up to his clash with Wladimir Klitschko back in 2015. The first leg of the fight’s three-city press tour had barely begun before Fury had Deontay seeing stars with this Frank Sinatra/squatter’s rights mash-up. Luckily for the Bronze Bomber, his inspired interlocutor is keen to help him get back to the top after their Staples Center showdown. …not to mention his entire approach to the sweet science. Of course, the Gypsy King won’t be offering too much insight on how to improve to his opponent until after he’s executed his masterplan. 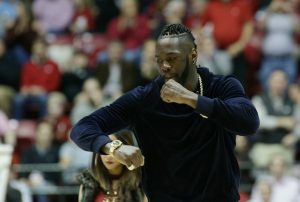 It won’t matter how many bombs Deontay attempts to detonate either, he’s boxing a 6’9” ‘Pretty Boy’. Fury clearly considers himself far from a jammy dodger, but his teasing may have gotten a bit rich for the Wilder digestive system with this baked-goods-based simile for the Alabama native’s fragile mitts. Bet on all the best Wilder vs Fury betting odds and markets at William Hill, where we won’t be beaten on round betting prices between now and the start of the first round.